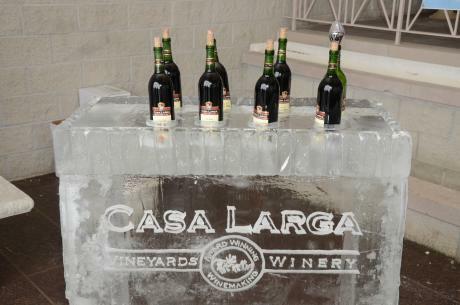 On February 16, 2019, the 11th Annual New York Ice Wine & Culinary Festival will take place at Casa Larga Vineyards. 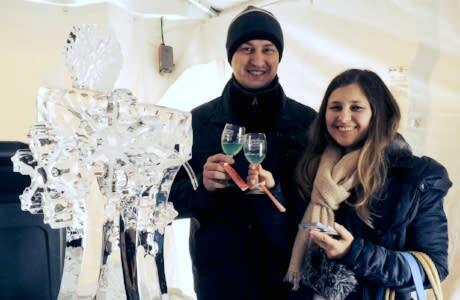 The event will include tastings from the many other New York State wineries that make traditional ice wine, sampling of ice wine-inspired (and infused) cuisine, shopping with local vendors, and the opportunity to attend educational wine seminars. But what exactly is ice wine? Liquid gold, the nectar of the gods, heaven in a glass, winter’s harvest--Ice Wine is so much more than just a sweet wine. 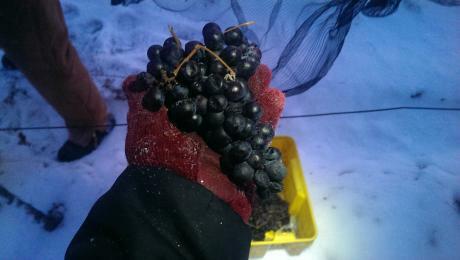 Ice wine is produced from fruit that has endured all types of weather and endured it well past the typical fall harvest. The grapes are outside in the sun, in the rain, in the wind, in the snow, in the freezing cold. You need fertile soil good for growing grapes, and temperatures that dip below 17 degrees Fahrenheit during winter to produce a true ice wine. 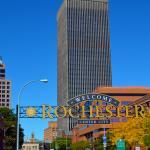 New York State is among these honored few locations with rich glacial soil and plenty of cold temperatures during the winter to make the magic happen. Not all grapes that make wine can make ice wine. Certain varieties of grape grow better in certain areas. Of the vines that are hearty enough to withstand winter, some of the fruit is too delicate for prolonged exposure to the cold. The most common varietal for ice wine is strong and hardy Vidal Blanc. 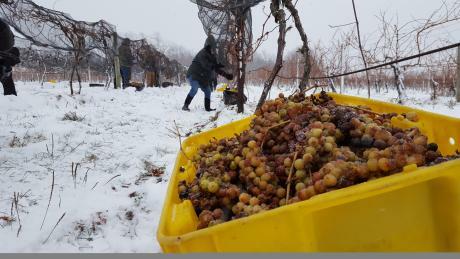 Ice wine can also be made from Cabernet Franc, Riesling (the Finger Lakes signature varietal), Gewurztraminer and a few others. Few winemakers are brave enough to make it and those who are, are invited to the festival each year. Leaving grapes on the vine past fall harvest places those grapes at more risk than any other grape. They could fall prey to hungry birds, freak weather storms, and if the freezing temperatures don’t come, the entire crop is at stake. Because the juice is concentrated, it takes a large amount of grapes to produce a small amount of ice wine. Grapes must be hand-picked as the rows of vines have been netted to protect the fruit against birds. Typically, during fall during harvest, many wineries can use large machinery to more quickly harvest acres and acres of grapes. But not for ice wine. 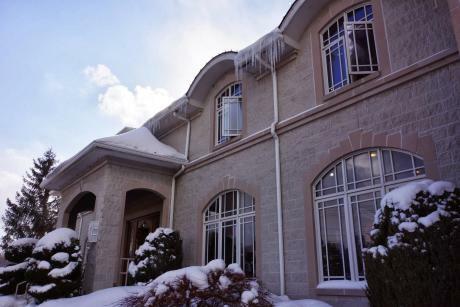 The sharp frost freezes the water in the grapes while leaving the natural sugar and fruit acids as a syrupy liquid. Any extra water in the juice would water down the final product. The grapes are pressed, still frozen, immediately after being picked and the syrup is then fermented into wines of intense aroma and taste. See, swirl, sniff, and sip! Tasting an ice wine is very similar to tasting a “still” or standard wine. Look at the color (ice wines have beautifully rich colors), swirl it around in the glass to release the aromas, sniff the wine to determine what it smells like to you, then taste it. Hold it in your mouth for a second, then – wait for it, wait for it – ahhh. Try to identify the flavors you are tasting. Get ice wine certified at the 2017 festival in a seminar with Rochester Institute of Technology Lecturer Lorraine Hems, an expert in wine and spirits. You can cook with it. For the fifth year, Chef de Cuisine Autumn Geer of RIT’s Brick City Catering has prepared recipes infusing ice wine into foods. Savory dishes benefit from the rich flavors that ice wine provides. From salad dressings and sauces to soups and desserts, ice wine is a delicious ingredient. 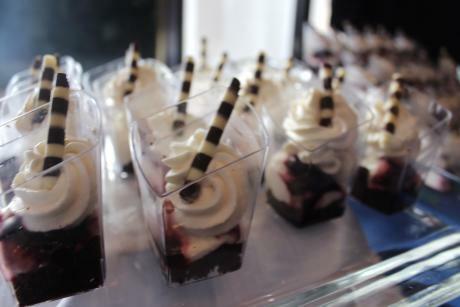 Taste the Chef’s creations yourself at the festival and learn more about cooking in the Chef Cook-Off seminar! Anything wine can do, ice wine can do better. Did you know that wine and ice wine can be used in delicious cocktails? Casa Larga Vineyards is a family business committed to the traditions of winemaking, including the traditional German eiswein method. 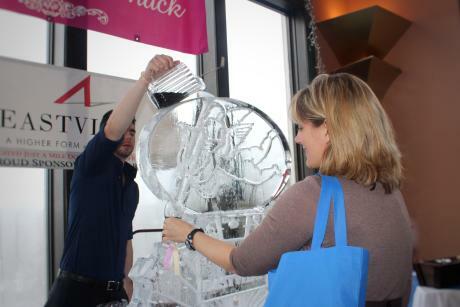 They created the NY Ice Wine & Culinary Festival to raise awareness of true ice wine and their producers. Tickets to the festival are $65 each, available online, at the Casa Larga wine shop, and at Wegmans.